People following a low-carb or low-sugar diet often turn to low- or zero-calorie sweeteners to help them stick to their program. Giving up sweet treats can be a challenge. But not all sugar alternatives are the same. Some sweeteners—such as maltitol—still provide calories and have an effect on blood sugar. Maltitol is a sugar alcohol—a type of carbohydrate that is neither sugar nor alcohol. Sugar alcohols are found naturally in some fruits and vegetables. They may also be commercially produced to be used as ingredients for various foods and beverages that we consume. Maltitol and other sugar alcohols such as erythritol are commonly used in low-carb or “sugar-free” products such as candy and nutrition bars. These sweeteners are similar to sugar in terms of taste, texture, and interaction with other ingredients. Products that use maltitol and other sugar alcohols as sweeteners can be called “sugar-free,” despite the fact they might still affect blood sugar. Although claims are often made that maltitol has little impact on blood sugar, that is not the case. Like sugar, maltitol is a carbohydrate that contains calories. The body does not absorb all the calories in maltitol, but it still provides about 2 to 3 calories per gram, compared to four calories per gram of sugar. Since maltitol is a carbohydrate and has calories, it also affects blood glucose. Maltitol syrup has a glycemic index of 52, which approaches that of table sugar at 60. The glycemic index is a measure of the effects of food on raising your blood glucose level. The powdered form has a glycemic index of 35, which is still higher than most other sugar alcohols and higher than all artificial sweeteners. Maltitol is estimated to have around 75 percent to 90 percent of the sweetness of sugar. Information provided by industry groups tends to give the 90 percent figure, while other sources say 75 percent. If Maltitol has three-fourths of the sweetness of sugar, three-fourths the calories of sugar, and three-fourths the glycemic index of sugar, it isn’t a far leap to the conclusion that you need one-fourth more maltitol to get the same effect as sugar. If you consume slightly more maltitol you may not gain a substantial benefit when you use it as a replacement for sugar. In fact, you're basically making maltitol a more expensive way to sweeten your food. While maltitol shares some drawbacks with sugar, it does provide some benefits that are notable. If you swap maltitol for sugar in equal amounts, you will gain a small caloric deficit. If you are a person who typically consumes significant calories from sugar each day, the increased calorie deficit may provide a benefit. Additionally, it may help you to wean yourself off of sugar completely if you gradually decrease the amount you use. Maltitol may better for your teeth than sugar. Researchers have studied the use of maltitol products on dental health with some positive findings. However, they are cautious about recommending maltitol over other low- or zero-calorie sweeteners. In one report, dental researchers evaluated the impact of sugar alcohols on dental health. They noted that xylitol products provide the greatest benefit for your teeth (when used as an alternative to sugar). Regarding maltitol, they concluded that there is some evidence to support that it promotes better dental health, but evidence is lacking on whether it prevents cavities. In another study, researchers evaluated gingivitis and plaque scores on people who chewed gum sweetened with maltitol or xylitol as compared to people who did not chew gum at all. They found that gum chewers who were not regular teeth-brushers gained a benefit from increased saliva flow. So, if you are someone who uses gum to alleviate a dry mouth or freshen breath, switching to a maltitol-sweetened gum may help you achieve the same benefit without the added sugar. Maltitol may provide certain health and dental benefits for some people, but research has provided mixed results about the advantages of using this sweetener, especially when compared to others on the market. Some people who consume maltitol, especially in large quantities, may experience intestinal gas and cramping. Others may even experience more severe cramping and diarrhea. If you decide to eat or drink products with maltitol, start with a small amount at first. See how your body reacts. If you notice side effects or if you're concerned you may be sensitive to maltitol, be mindful of where and when you eat it. Cut back or eliminate it from your diet if necessary. If you experience severe symptoms, try a maltitol alternative or talk to your doctor about your digestive symptoms to rule out any other problems you may be having. There are several sugar alternatives on the market and each has its own pros and cons. Most provide fewer calories (or zero calories) as compared to maltitol. But some have a taste or texture that you may not prefer. The best alternatives to products with maltitol are usually made with erythritol. 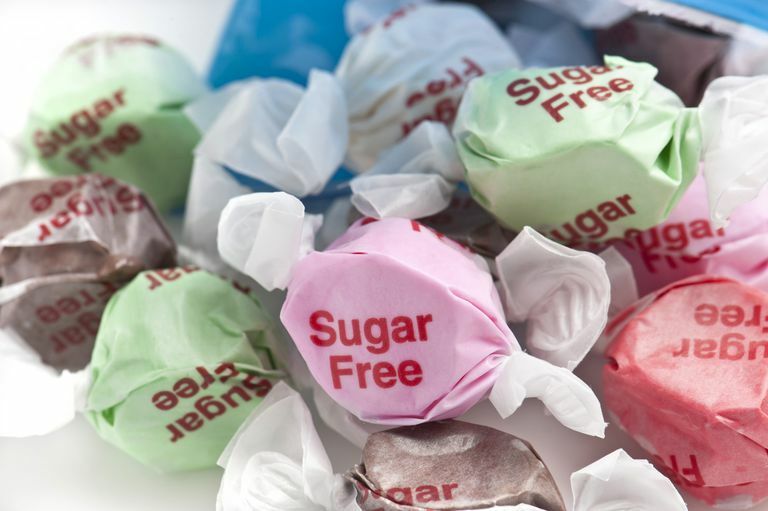 Products made with erythritol may combine the ingredient with other artificial sweeteners such as sucralose (Splenda) for optimal taste and texture. But almost any other sugar alcohol is at least a little better than maltitol. You can also use a low-calorie sweetener like stevia, which has less than four calories and zero carbs per packet. Stevia is considered a more "natural" sweetener and is preferred by some for that reason. Stevia also has a glycemic index of zero, making it a safe choice for people with diabetes and those following a low-carb or low-sugar eating plan. If you choose to cook or bake with maltitol or use it in your kitchen, you may have a hard time finding it to purchase. While you'll see many other sweeteners in the baking aisle of your local market, maltitol is not widely available. However, you can buy the product online and in some specialty stores. The product is more often used by commercial bakers and food producers than home cooks. Maltitol is available in granular, powdered, and liquid (syrup) forms. If you use it to sweeten your tea or coffee the liquid form will work best. Some cooks also say that you can use maltitol syrup instead of corn syrup or honey in recipes. However, baking with powdered or granular maltitol may be a challenge and will require substantial trial and error. Kearsley, MW, Boghani, N. Maltitol. In: Alternative Sweeteners. 4th ed. Boca Raton, FL: CRC Press; 2012. Maltitol. National Center for Biotechnology Information. Office of Federal Register, General Services Administration, Code of Federal Regulations. Title 21, Section 101, Food Labeling: Health Claims; Sugar Alcohols and Dental Caries. Sugar Alcohols. U.S. Food and Drug Administration.